Calling all eventing enthusiasts! Petplan Equine are giving 13 readers the chance to win a pair of tickets to walk the Mitsubishi Motors Badminton Horse Trials 2018 cross-country course with Lucinda Green MBE. The six-time Badminton winner will provide an invaluable insight into the cross-country course from her past experiences, give tips on how to tackle the fences and be on-hand to answer eventing questions. Lucinda first won at Badminton Horse Trials in 1973, riding Be Fair. She later went on to win a further five times with Wideawake (1976), George (1977), Killaire (1979), Regal Realm (1983) and Beagle Bay (1984). Lucinda has also represented Great Britain at two Olympic Games. Lucinda says: “Badminton Horse Trials has always been very special to me and the cross-country course is particularly iconic. "It has evolved so much over the years and riding over the beautiful parkland at Badminton House and galloping across country and jumping through the lake is still the pinnacle of any rider’s career. 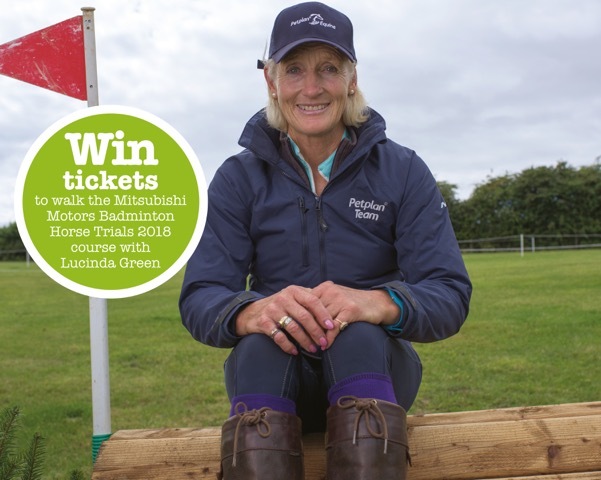 So, whether you’re planning on riding at Badminton Horse Trials yourself one day or would just relish the opportunity to meet Lucinda at such a prestigious event, enter Petplan Equine’s prize draw for the chance to win a pair of tickets for you and a friend. The course walk will be held on Wednesday 2nd May and the winners will meet at 1pm at the start box. To be in with a chance of winning, head to the Petplan Equine website and complete the entry form before 11.59pm on Monday 23rd April 2018. Full terms and conditions.